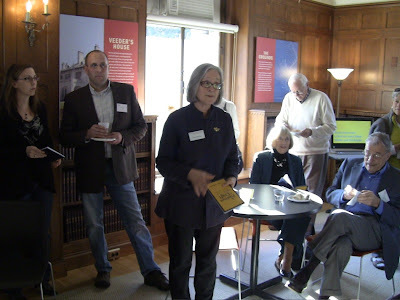 The exhibit brochure, with photos of a Seymour chest built by Freddy Roman, a Philadelphia desk and bookcase built by Brooke Smith, and a North Carolina armchair built by Benjamin Hobbs. 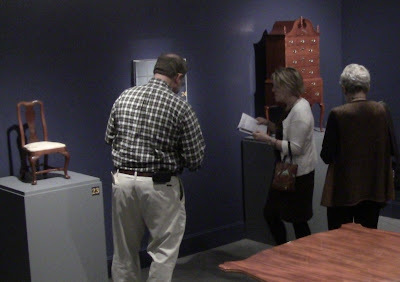 Friday I attended the reception for the opening of "A Tradition of Craft" at the Connecticut Historical Society, a juried exhibition of current work by members of the Society of American Period Furniture Makers. CHS Communications Director Ed Main had invited me after seeing my post on the March SAPFM meeting, where I had mentioned the exhibit. CHS Executive Director Kate Steinway makes opening remarks. 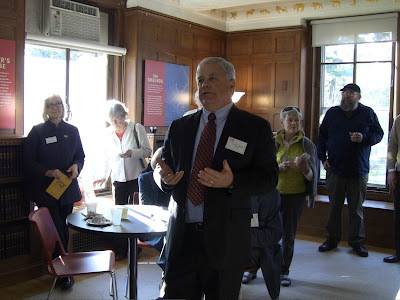 SAPFM co-founder Mickey Callahan introduces the exhibit. It's always a treat when I meet readers of the blog. I was particularly flattered this time when Don Williams introduced himself and told me he enjoys reading it. Don is Senior Furniture Conservator at the Smithsonian Institution's Museum Conservation Institute. 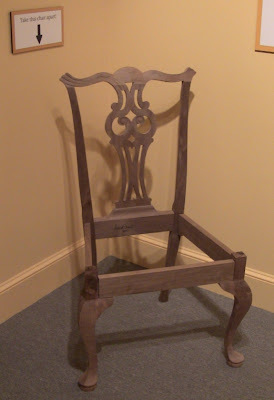 You can read his bio and CV, and Popular Woodworking Magazine posts about his work and the reproduction Gragg chair featured in his article in the current American Period Furniture, SAPFM's annual journal. Don Williams of the Smithsonian's Museum Conservation Institute. Yes, he's wearing red suspenders under that jacket. Don also said he refers people to my videos (part 1 and part 2) when they have questions about the features of the Roubo workbench. Thanks, Don! Before we get to the exhibit proper, here's a unique experience. 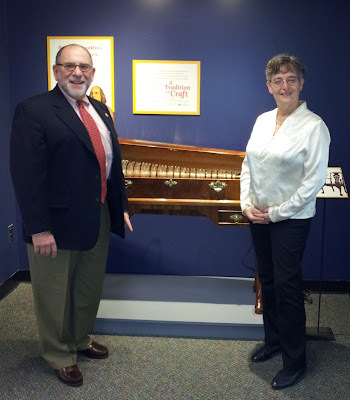 Steven Lash, past SAPFM president, had his glass armonica on display. Vera Meyer, of Malden, MA played it throughout the evening. The armonica was an invention of Benjamin Franklin's, after he heard music played with moistened fingers on wine glasses. The instrument consists of a series of tuned glass bowls mounted on a rotating shaft. Like wine glasses, it's played with wet fingertips. 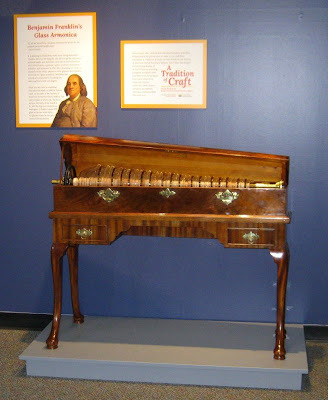 Lash based his reproduction case on an original instrument at the Franklin Institute in Philadelphia, PA. The actual instrument he installed was built by Gerhard Finkenbeiner, the bowls tuned like the keys of a piano. He said most armonicas are played sitting on a tabletop, but the case acts like a guitar or violin body, adding resonance to the sound. Steven Lash and Vera Meyer. Photo by Steven Lash. The armonica. The case has a conical, coopered lid. 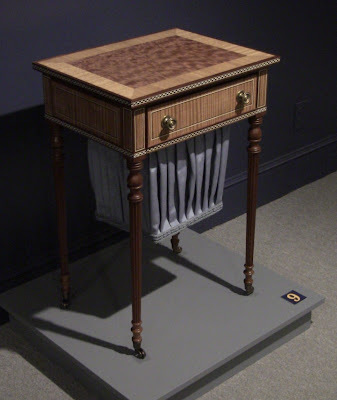 The small drawers on each side hold water for the musician to dip her fingers into. Photo by Steven Lash. In the short video below, you can hear the instrument's ethereal sound. Vera is available for concerts and performances, one of the few armonica players in the world. With a wide repertoire, she would make a unique musical addition to any event. You can reach her at meyer_vera@yahoo.com, or 781-321-0210. On to the exhibit. As usual, these photos don't begin to capture the beauty of the pieces. You need to see them in person to fully appreciate the depth of the grain and finish, and the fine craftsmanship that went in to them. I apologize if I missed anyone's work. 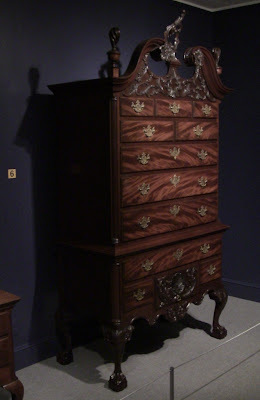 Remember the Federal-style Seymour chest Freddy Roman was working on when I profiled him? 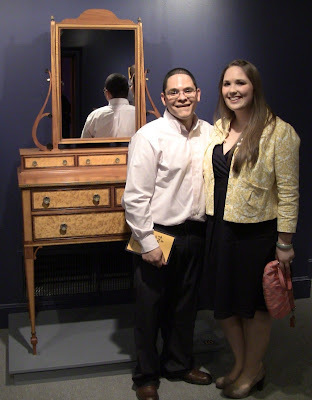 Freddy Roman and his girlfriend Krista Bromley, next to Freddy's spectacular Seymour chest. While this is the same design as the one on the exhibit brochure, he changed a few details. One of the interesting things CHS did here was show original pieces from their wonderful collection alongside current reproductions. 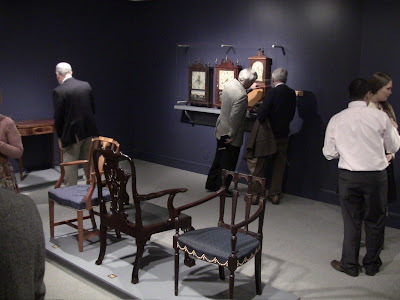 When they first announced plans for the exhibition, they offered SAPFM members access to the collection to find pieces they would like to reproduce. This was a fantastic opportunity. The reproductions were faithful in style, with some personalized adaptations. 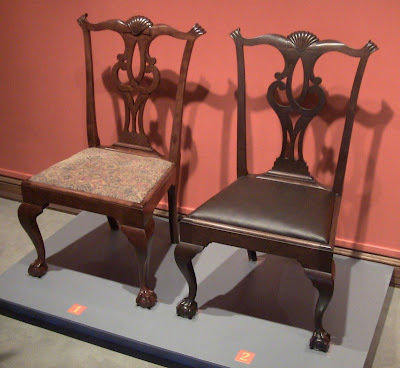 Left, Chapin side chair by John Rexroad. 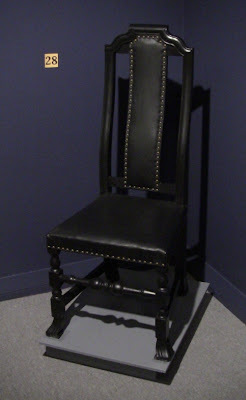 Right, original Eliphalet Chapin side chair, 1781. 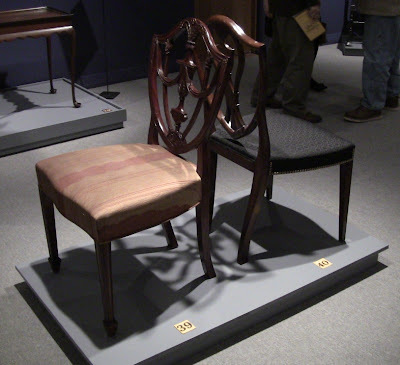 From left, Langley Boardman armchair by Kevin Ainsworth; North Carolina armchair by Benjamin Hobbs (featured on the cover of the current American Period Furniture); and McIntyre Sheraton armchair by Phil Lowe. It's worth noting that a number of the exhibitors here have been students of Phil's at his Furniture Institute of Massachusetts. 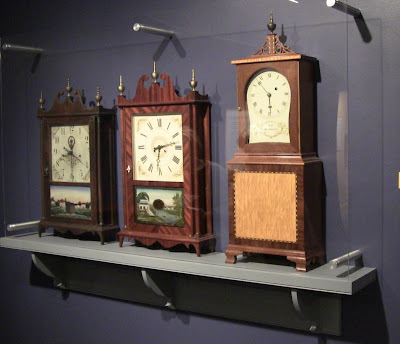 From left, Eli Terry pillar and scroll shelf clock, 1818; Eli Terry shelf clock by Glenville Jewell (with construction article in current American Period Furniture); and Willard shelf clock by Don Irving. 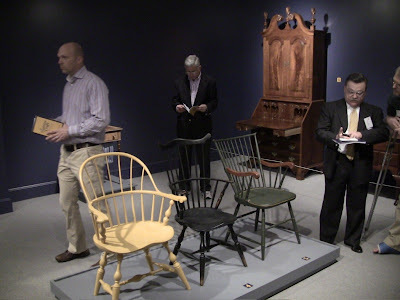 From left, New York sack-back Windsor chair by Nickolas Kotula; high-back Windor armchair, ca. 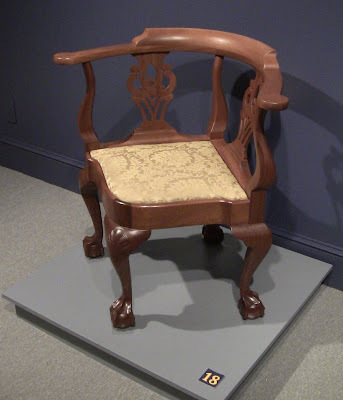 1785; and rod-back Windsor armchair by Terry Kelly. The gentleman standing to the right is SAPFM president Bob Mustain. In the background is a Philadelphia desk and bookcase by Brooke Smith. Nickolas Kotula with his chair. He spent many hours hand-grinding the pigments to get just the shade of yellow he wanted. 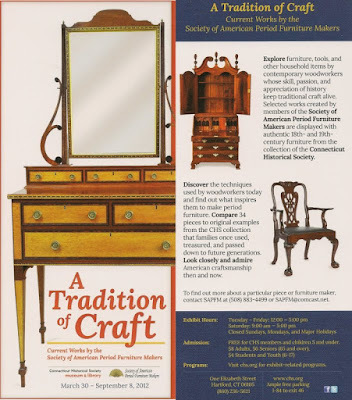 He has a wonderful article in the current American Period Furniture about being the last apprentice at the Nathan Margolis cabinet shop. 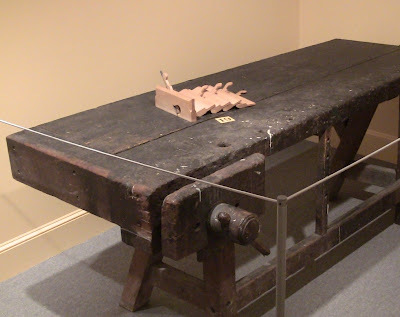 Federal work table by Bruce Wedlock. I know Bruce through the GNHW project building a Townsend document chest with Al Breed. He's a retired professor of Electrical Engineering and mathematics at MIT, and his friends are always ribbing him about formulas and micrometers while working with wood. As you can see, that precision pays off. 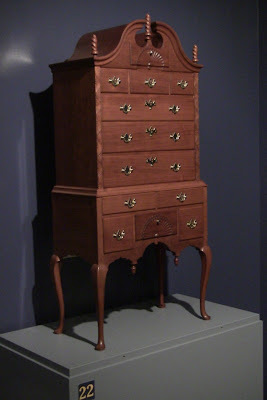 Philadelphia Chippendale high chest by James Hardwick. 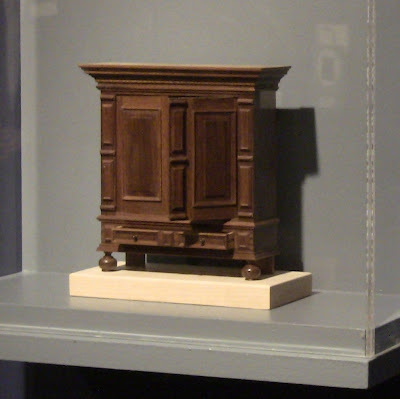 To its left, not shown is a Chippendale dressing table in Philadelphia style, by Eliphalet Chapin, 1783. 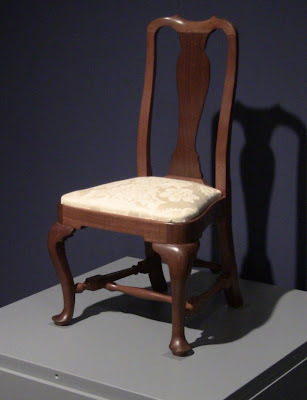 New York Chippendale corner chair by Mickey Callahan. 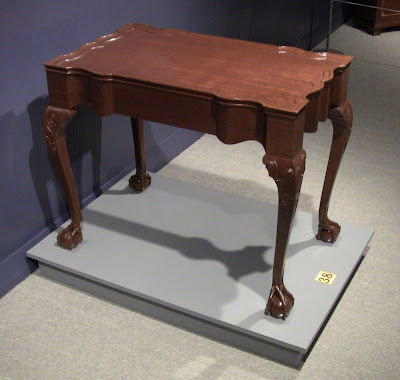 Newport tea table by Philip A. Houck. 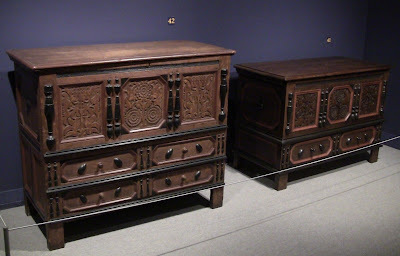 Left, Connecticut "sunflower" chest, ca. 1680. Right, reproduction by Richard Nucci. Left, McIntyre shield-back chair by Alf Sharp. Right, side chair ca. 1795. Left, Federal knife-boxes by Richard Crouse. Right, Portsmouth bow-front sideboard by Peter Aleksa. 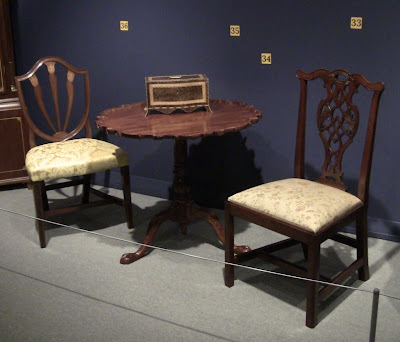 From left, Baltimore side chair by Peter Van Beckum; Robert Walker Virginia tea table by John Davis; Federal tea box by Aaron Hall (with construction article in current American Period Furniture); and Thomas Elfe side chair by Jim Altemus. 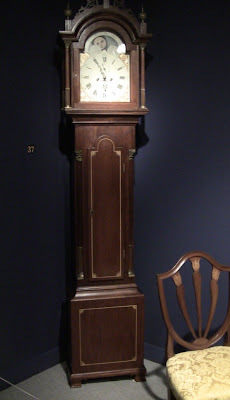 Roxbury style tall case clock by Gerald McAleavy. 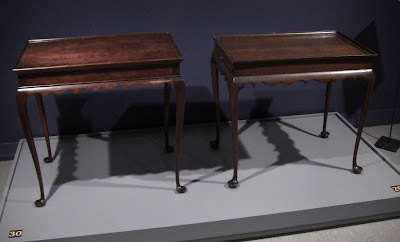 Left, Connecticut River Valley tea table by John LaGattuta. Right, New England tea table ca. 1760. 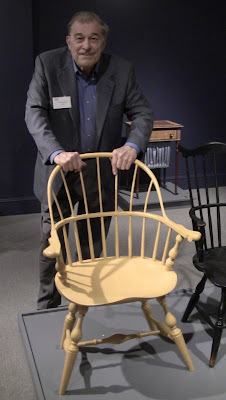 William and Mary Boston chair by J. Wesley Sunderland. Tilt-top starburst candle stand by Gil Tyler. 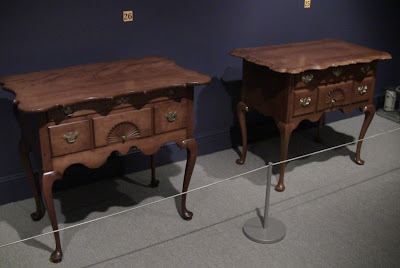 Left, Connecticut River Valley dressing table, ca. 1770. 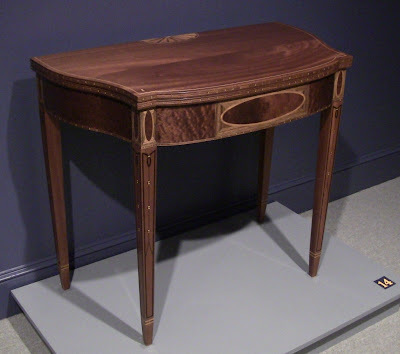 Right, Connecticut River Valley dressing table by Robert Surette. 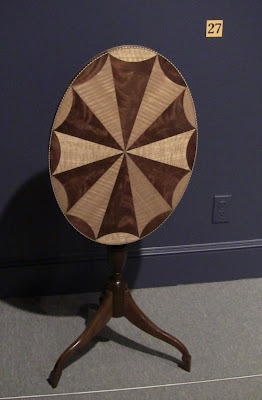 Half-scale Queen Anne side chair by E. Jeff Justis. 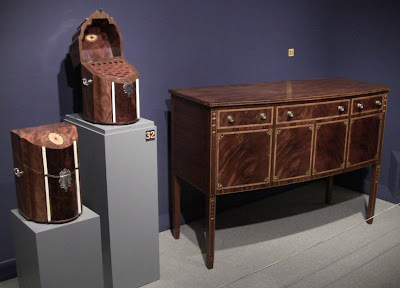 Miniature Connecticut River Valley Queen Anne high chest by Larry Mauritz. Here you can see the two miniatures in scale. Miniature Dutch kas, 1/12th scale, by Iulia Chin Lee. 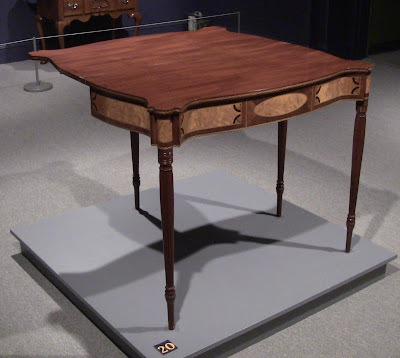 Federal game table by Robert Stevenson. 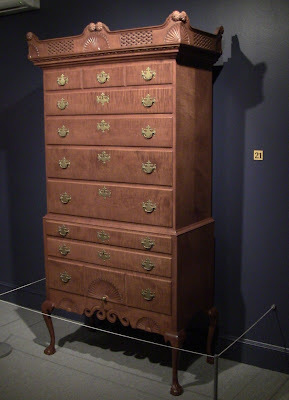 Dunlap highboy by Donald Boule. Hepplewhite card table by Sharon Mehrman. Moulding planes by Matt Bickford. 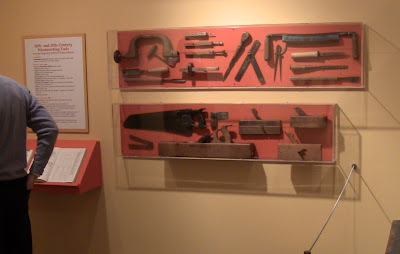 A display of period woodworking tools. A hands-on display: take-apart side chair by Alf Sharp. 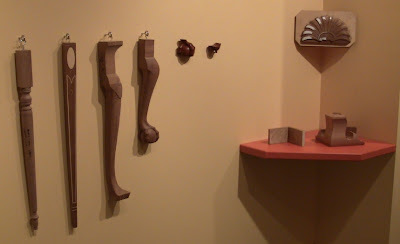 Leg, carving, and foot samples. The exhibit runs through September 8. It's well worth a visit. Not only is it good to see such beautiful furniture, it's also good to see contemporary artisans keeping the tradition of craft alive. While you're there, don't miss the other interesting exhibits. I saw an awesome treadle lathe in the "Making Connecticut" exhibit that I'd love to reproduce, looked to be early 1800's. Using that would be a fantastic interactive demo! Thank you for sharing information about CHS event with the on-line woodworking community. I feel like you thoroughly covered the event, attendees, and exhibits. Those miniature pieces are terrific. I cannot imagine making cabinet joints in that scale. 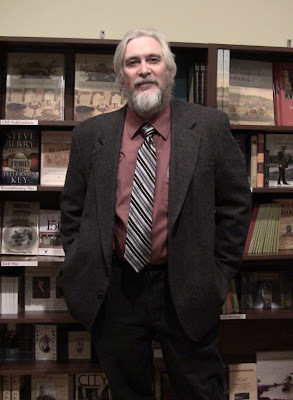 I am glad to hear Don Williams recommends your cite to interested readers. You have one of the best written woodworking blogs on the net.